Identify the exact location and date of the Mystery Foto. The gas station/store was located on the northeast corner of the interesection of Commack Road and the Long Island Motor Parkway. Who was the owner of the gas station and what was his relationship with the Motor Parkway? The owner was Louis "Lou" W. Austin of Commack. As previously documented on VanderbiltCupRaces.com, the Motor Parkway decided in 1922 to place a new toll collection structure at this very busy intersection in Commack. The kiosk from Washington Avenue in Brentwood was relocated to this busy intersection of Commack Road and the Motor Parkway. 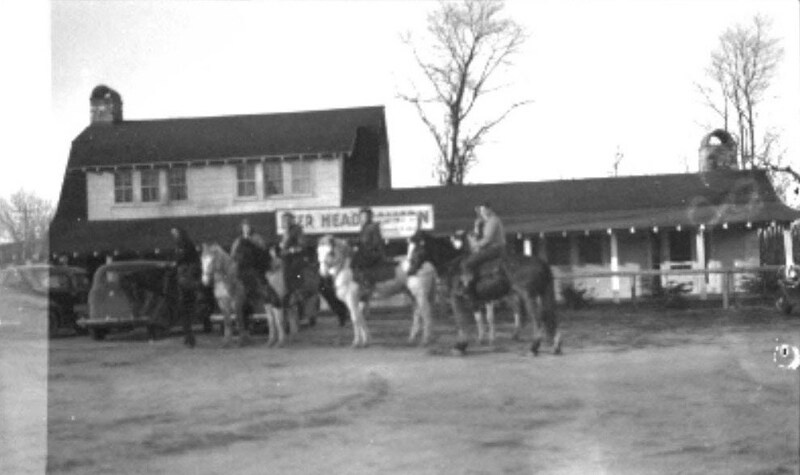 Lou Austin was the toll collector for the Brentwood Lodge from its opening on April 29, 1922. Austin negotiated a good deal with the Motor Parkway in that he was allowed to sell gasoline and automobile supplies at the kiosk as long as it did not intefere with his gatekeeper duties. Louis Austin purchased the kiosk ("formerly Brentwood Lodge) from the Motor Parkway for $40 and rented the property for $25 for 1923. By 1923, the Motor Parkway decided to build a new toll lodge with gatekeeper lodging facilities across the Motor Parkway on the southeast section of the intersection with Commack Road. Austin also purchased the north and south property from the Motor Parkway except for a a 130 feet by 330 feet section south of the Motor Parkway which was reserved "for future development of the Parkway and for a lodge site." On December 14, 1923, Austin resigned his toll collector position while continuing to service his gas station located on the Motor Parkway right-of-way. 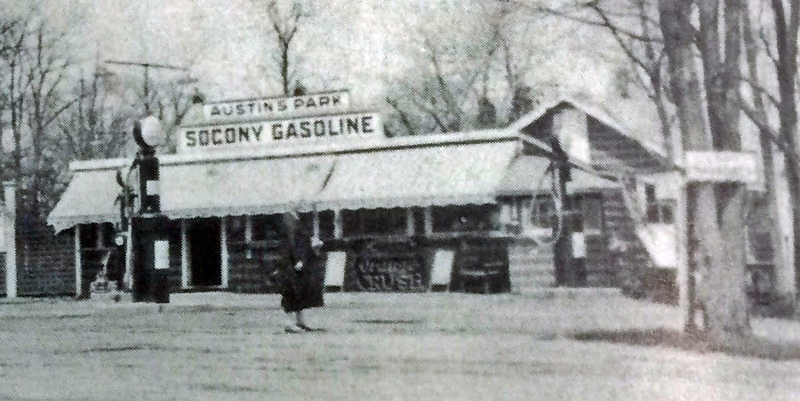 As seen in the 19/24/1925 Mystery Foto, Austin expanded the size of the building on his property, opened a restaurant and renamed it Austin's Park. What was located on this site before and after this gas station? The Brentwood Lodge (Kiosk) was the operating toll collection structure at this location from April 29, 1922 to December 14, 1923. According to<a data-cke-saved-href="http://By 1923, the Motor Parkway decided to build a new toll lodge with gatekeeper lodging facilities across the Motor Parkway on the southeast section of the intersection with Commack Road. 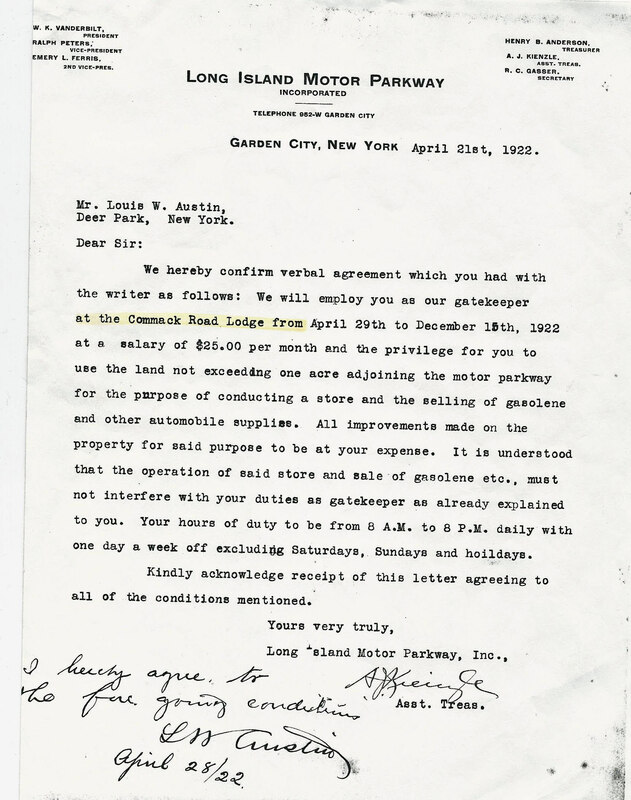 As shown in this correspondence, Louis Austin purchased the kiosk (" href="http://By 1923, the Motor Parkway decided to build a new toll lodge with gatekeeper lodging facilities across the Motor Parkway on the southeast section of the intersection with Commack Road. As shown in this correspondence, Louis Austin purchased the kiosk (" formerly="" brentwood="" lodge)="" from="" the="" motor="" parkway="" for="" $40="" and="" rented="" property="" $25="" 1923.="" he="" resigned="" his="" gatekeeper="" position="" while="" continuing="" to="" service="" gas="" station="" located="" on="" right-of-way.."=""> Sam Berliner III's wonderful website, Austin's Park became the Deer Head Tavern, then Heinie's Place and now is The Bonwit Inn. Can you spot other things in this photo that may be of interest? 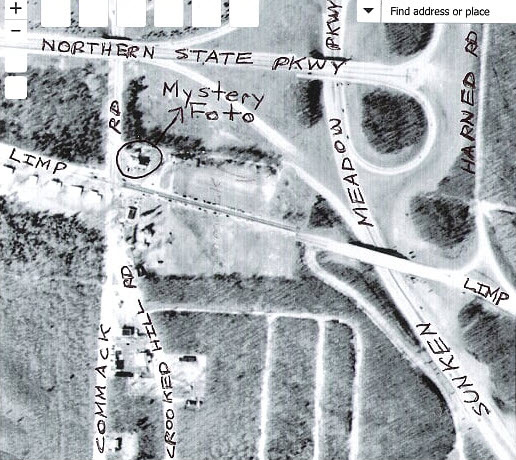 Here is why this Mystery Foto is unique: It is the only known image of the Brentwood Lodge kisok on its location at Commack Road. Look at the structure behind the gas pump on the far right of the Mystery Foto. As confrmed by my favorite co-author Al Velocci, this was the remains of the Brentwood Lodge that was purchased by Lou Austin in 1923 and moved to his property off the Motor Parkway right-of-way. It was likely used as a booth for the gas attendant. Neat!!! Congrats to Alex Arthur, Frank Mendyk, Tim Ivers, Steve Lucas, Frank Femenias, and Art Kleiner (see Kleiner's Korner). Kudos to Brian McCarthy and Frank Mendyk for spotting the remains of the Brentwood Lodge kiosk in the Mystery Foto. Look closely and you will see the remains of the Brentwood Lodge kiosk. This is a view of the kiosk on its original site on Washington Avenue. Brian found this photo in this photo in the Arcadia book on Brentwood written by Jason Adam Klosowicz. The photo was taken by Sister Anne Pulling and is in her collection in the Central Islip Library. I have requested a copy of the original and any other relevant photos for the library. 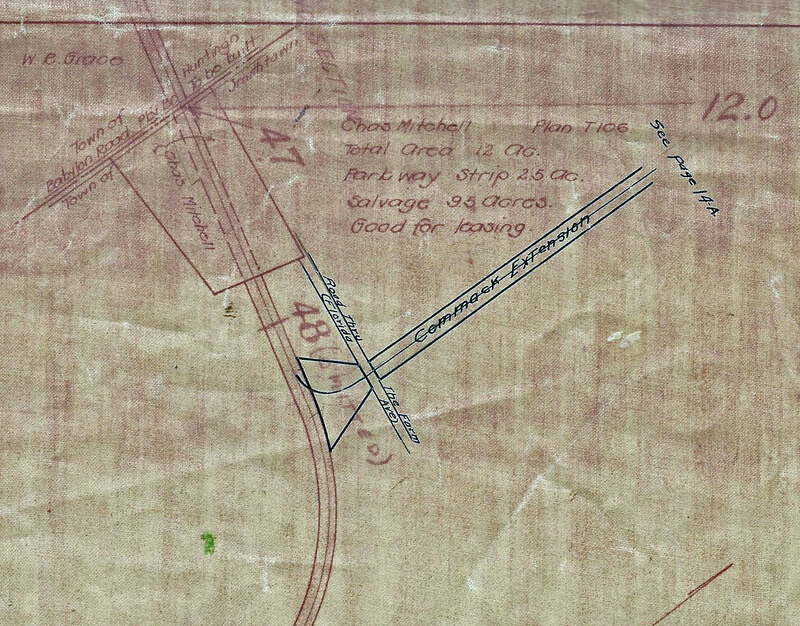 The hand-wriiten note:"Proposed Lodge Entrance"
Correspondence Between Lou Austin and the Motor Parkway. Courtesy of the Suffolk County Vanderbilt Museum. The lodge opened on April 29, 1922 with gatekeeper Louis W. Austin of Deer Park receiving $25 per month (equivalent to $4,250 per year today.) However, Austin actually negotiated a good deal with the Motor Parkway in that he was allowed to sell gasoline and automobile supplies at the kiosk as long as it did not intefer with his gatekeeper duties. 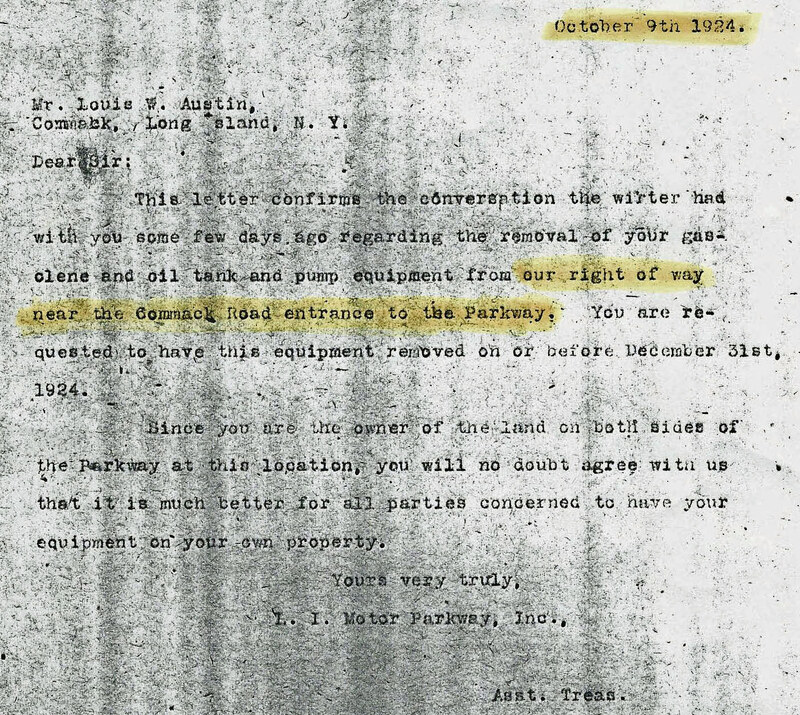 As shown in this correspondence, Louis Austin purchased the kiosk ("formerly Brentwood Lodge) from the Motor Parkway for $40 and rented the property for $25 for 1923. He resigned his gatekeeper position while continuing to service his gas station located on the Motor Parkway right-of-way. 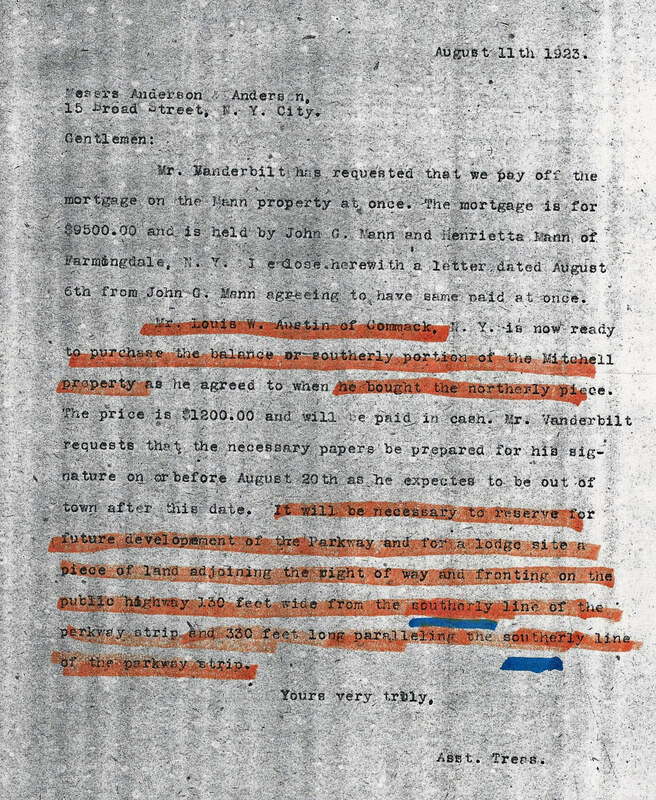 In this correspondence, the Motor Parkway confirmed that the property north and south of the Motor Parkway was later sold to Louis Austin. The sale excluded a 130 feet by 330 feet section south of the Motor Parkway which was reserved "for future development of the Parkway and for a lodge site." According to Al Velocci, the new lodge opened on December 12, 1923 with Julius Bohenkamp as the new lodgekeeper. 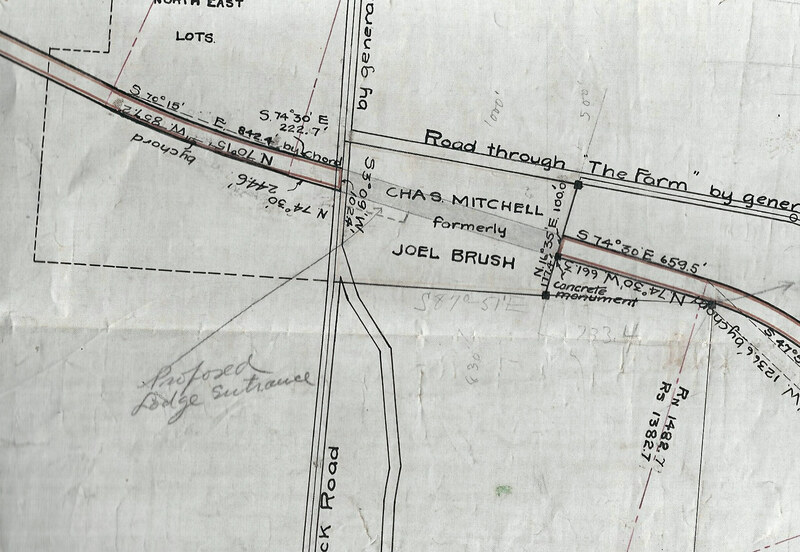 In this correspondence, the Motor Parkway requested that Louis Austin move his gas station off the right-of way. 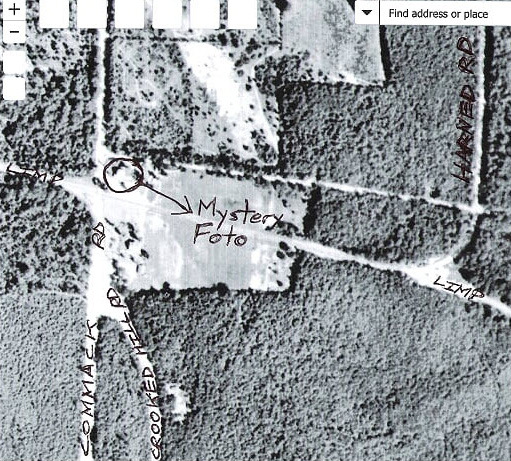 Austin likely moved the kiosk to the location seen in the Mystery Foto. 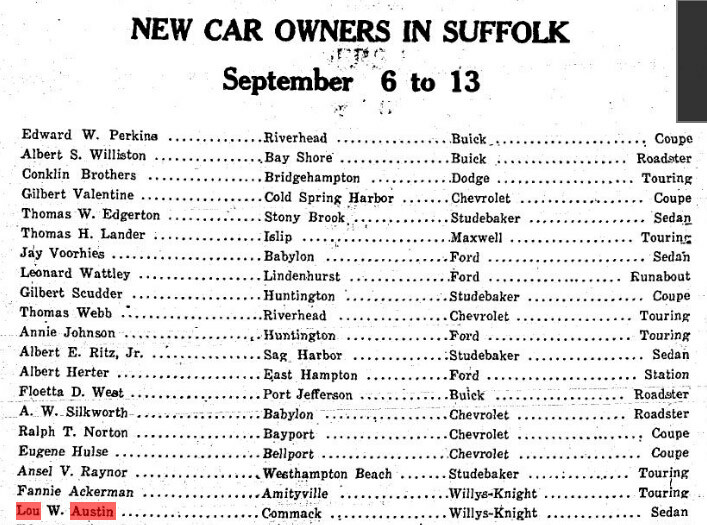 County Review, September 14, 1923 New car owners were listed in the Suffolk County Review in 1923. County Review, May 20, 1926 Lou and Aida Austin's problems made the news in 1926. Long Islander, August 27, 1926 Austin's "filling station and restaurant" was robbed on August 12, 1926. Suffolk County News, December 10, 1926 "The four men held up the latter's "Hot dog" stand and gas station on the Motor Parkway at Commack.."
Deer Head Tavern. Courtesy of Sam Berliner III. The Bonwit Inn. Courtesy of Frank Femenias. Before and After. Courtesy of Frank Femenias. 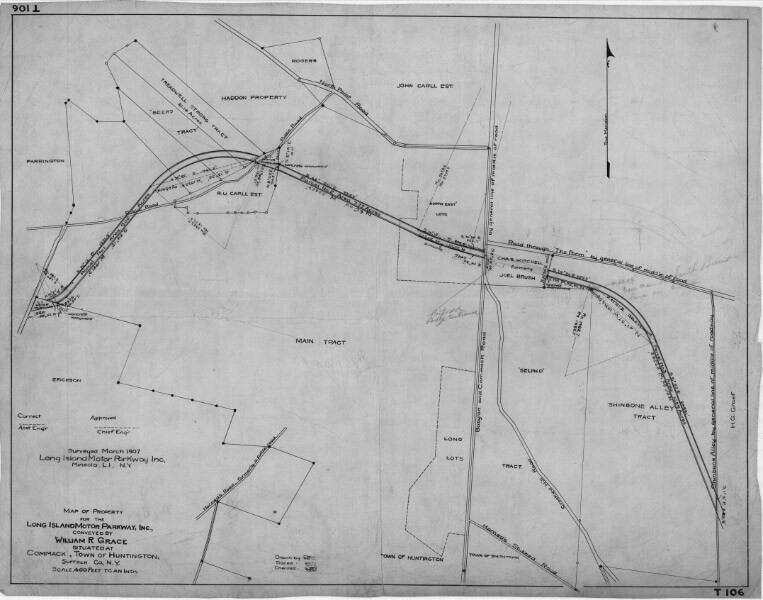 The location of "Brentwood Lodge" on Commack Road (1923-1928) was moved to the Commack Spur and a new toll collection structure was built in 1928. 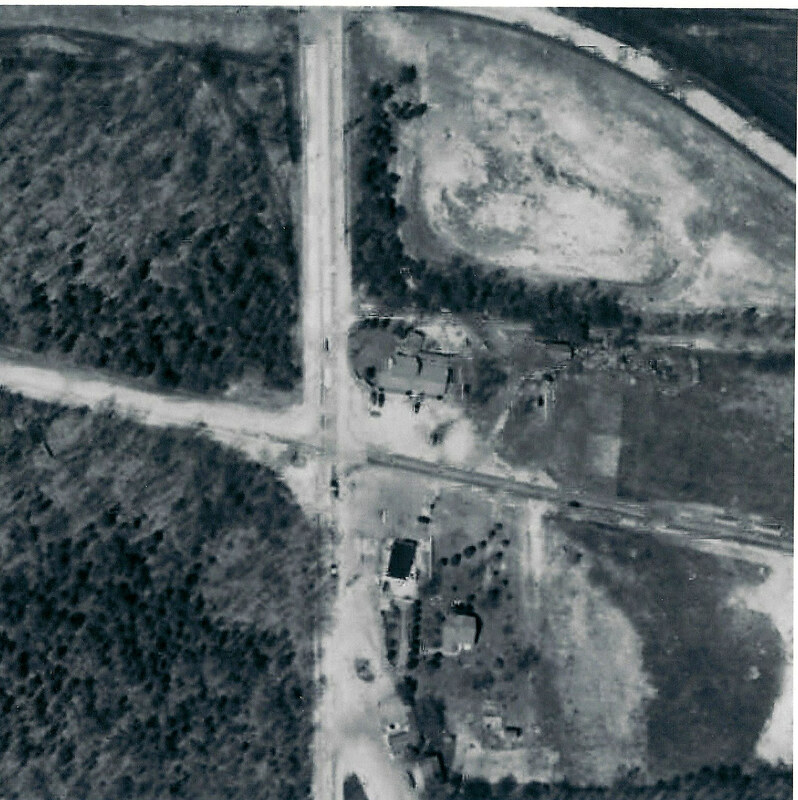 As seen in this close-up of the aerial, the lodge was built at a 45-degree angle allowing tolls to be collected from both the Commack Spur and the Motor Parkway. 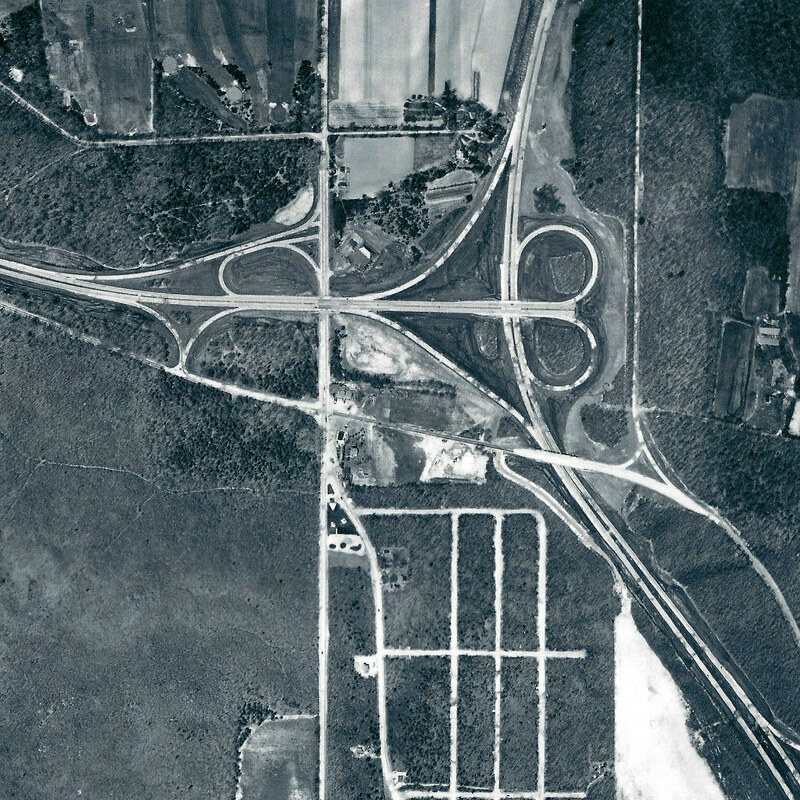 1955 Check out the terminus of the Northern State Parkway. 1947 Courtesy of Brian McCarthy. 1962 Courtesy of Brian McCarthy. 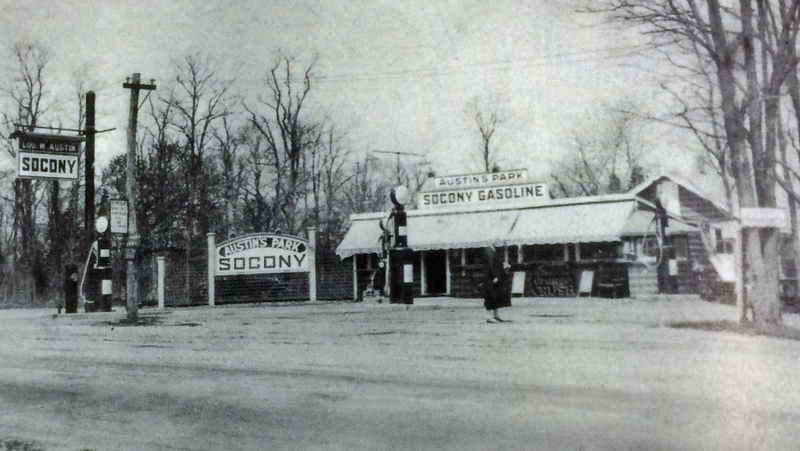 Lou W. Austin, formerly the toll lodge keeper at this location, opened the Standard Oil Company of NY (SOCONY) station when the lodge moved to the south side of Vanderbilt. Currently, this is the site of the Bonwit Inn. 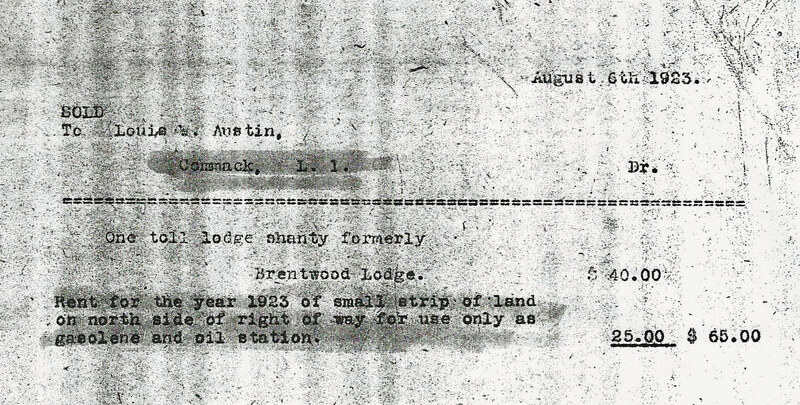 The owner of the Standard Oil Company of NY gas station was Lou Austin, the lodge keeper of the Brentwood #2 lodge that was on that site from 1922-23. In 1924 a new lodge was built on the S/E corner. The Bonwit Inn restaurant now occupies the original site. 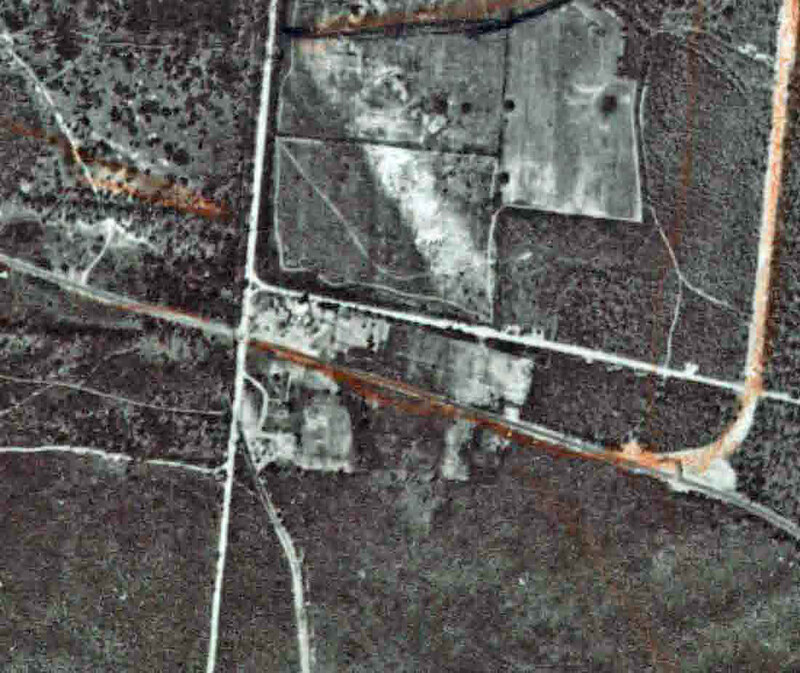 Northeast corner Commack Road and LIMP in 1924. He ran the Brentwood Lodge of the LIMP there. The lodge moved to the other side of the road, so he built the Socony station there. Currently it is the Bonwit Inn location. The right side porch has what appears to be a 55 gal. Drum and hand pump….kerosene? 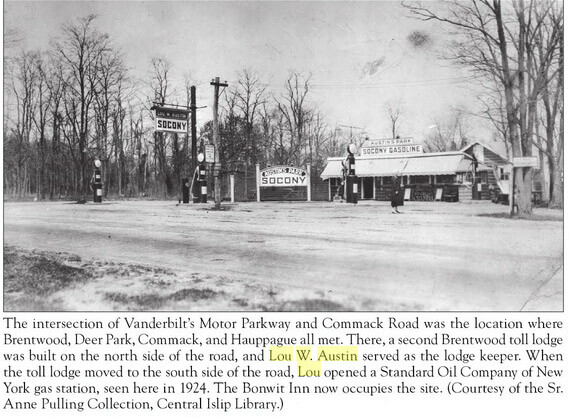 This photo dates from around 1924 and shows Lewis Austin’s gas & oil station (he probably did repairs as well) on the north side of the LIMP slightly east of Commack Road. Prior to this it had been the second site of the Brentwood Lodge, which actually had been the ticket booth / shanty that was moved from Washington Avenue with Austin as toll collector. Years later the Bonwit Inn would occupy this site. The building has the look of a diner so it could be one of the first “drive-in” burger joints. I also see telephone poles which are unusual for the LIMP right-of-way. This photo contains a caption that solves the mystery. I eagerly read it unwittingly disqualifying myself. Without the caption I don’t believe I would’ve solved it. Good luck to all on this tough mystery. Hope all are enjoying this mystery! 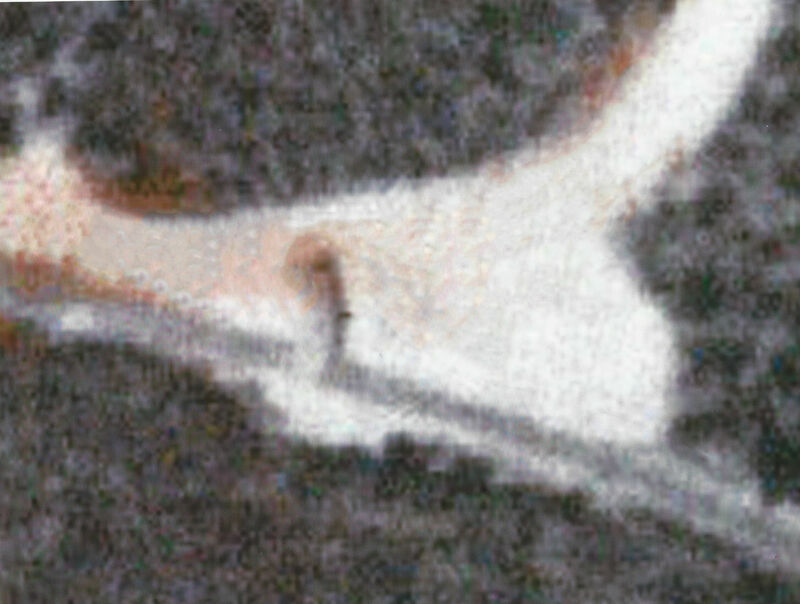 On the 3rd closeup ( right corner of station, with fuel pump ); there looks to be an octagonal structure that’s may be attached to the station. It appears that about 1/3 of this structure was removed, or just out of sight ( where it looks to be connected to the station building. ) Could this be the kiosk that was previously located at Washington Ave/LIMP? I know this location was the kiosk’s 2nd and final home. The only differences is it’s no longer painted white, and the windows may have been replaced. The 3rd “Brentwood Lodge Designation” was at the opposite corner of this intersection ( southeast ). An entirely new structure was built there. The 4th “Brentwood Lodge Designation” was at the intersection of Harned Rd/LIMP. This was also a entirely new structure. Identify the exact location and date of the Mystery Foto. 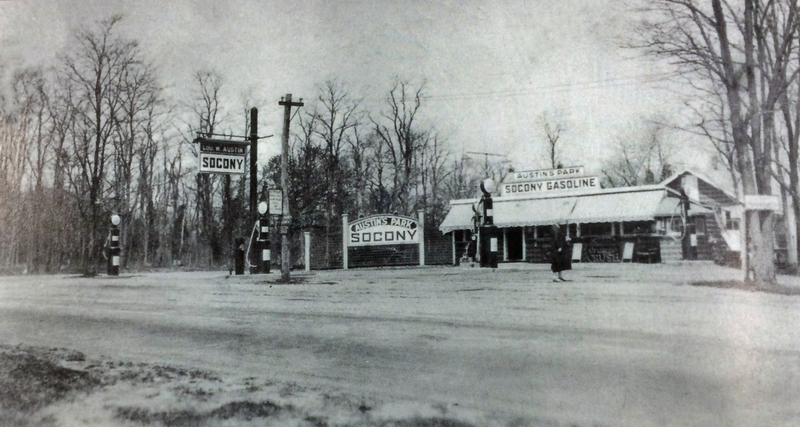 1924, southside intersection of the Motor Parkway and Commack Road. Who was the owner of the gas station and what was his relationship with the Motor Parkway? 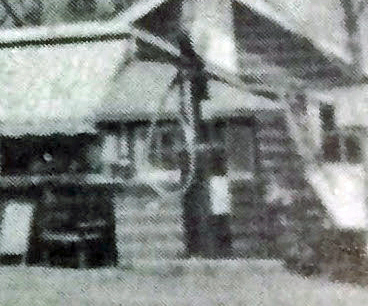 Lou W. Austin owned the gas station and “hot dog stand” (see documentation) which he built after the toll lodge on the northern side was opened. Austin was the original toll keeper at Brentwood location. What was located on this site before and after this gas station? The site before the gas station was the site of the original Brentwood toll booth (e.g., not lodge) afterwards eventually became the Bonwit Inn Restaurant. I searched the “NYS Historic Newspapers” website for Lou W Austin ( embossed on sign in front). Although I bookmarked the few “interesting” articles concerning him, not so sure about submitting them here. 1926 was a rough year for him. In July 1946, he and his wife moved to Maine. 2nd - the orange crush sign in front of the building? 4th - the hidden automobile behind the “Austin’s Park Socony” sign and fence. There also appears to be a bicycle or motorcycle in front of the automobile. Howard, do you think that the photo of the woman in the station lot could be Sister Anne Pulling? It’s could be her or another sister possibly from the convent Sisters of St. Joseph from nearby Brentwood. Frank, it could be. Central Islip Library is pulling the Anne Pulling Collection for me. The answer may be in these archives. WOW, what incredible finds by all. This mystery really did open up a can of worms. Art’s findings, as always, are amazing with historical facts to clarify. And the kiosk, half sawed to its size, (that I missed), another incredible find! Nice find by “eagle eye’d” Al for revealing this. I wouldn’t have got this by myself.